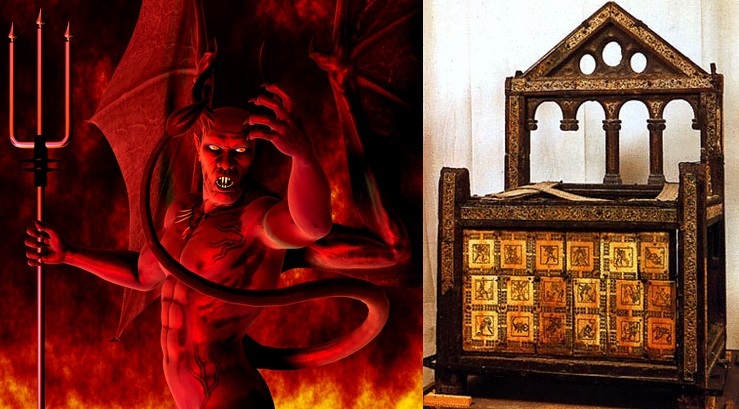 Satan on the left, and to the right the chair in which Saint Peter used to sit. This Sunday, November 25, 2018, during the sermon at Saint-Zéphirin-de-Stadaconna in Quebec City, Father Garrick Huang, FSSP, apparently excommunicated me. Since several other parishioners also understood the same thing, I assume I didn't have an auditory hallucination. 2) What did Father Huang say exactly? First of all, especially for such a bewildering case, I would like to respect my own careful method, but it is difficult to quote someone verbatim, when this person doesn't put his statements in writing! Father Huang did not seem to read his sermon, and I did not see anything on the FSSP website in Quebec City or in the parish bulletin. Father Huang said during the sermon that if we said that Jorge Mario Bergoglio was not the Pope, then from now on, "I ask you not to come back here anymore". 2.1) Others understood the same thing. Still in shock, I spoke to three other parishioners after Mass, who also told me that they had almost gotten up and stormed out of the church and slammed the door at that moment. I stayed until the end of the Mass because of the supplications of a dying woman who has ALS. Their reason for staying was that they were dressed in cassocks and surplices and they were serving Mass, so they were embarrassed to get up and leave in front of everyone! 2.2) Huang was serious. The priest didn't talk about some slight superficial disagreement. He did not say something like, "If you find that the carpet smells bad here in Saint-Zephirin, go to Mass in another Catholic church in Quebec City." 2.3) Huang spoke specifically of excommunication. He never mentioned the word "excommunication," but the content of his sermon was precisely the concept of ecclesial communion. People who are in communion with the Pope are in the Catholic Church, and those who reject communion with the Pope are elsewhere, they are in a place that is not in the Catholic Church. 2.4) No dialog was offered. The priest didn't say: "If some of you have doubts about Pope Francis, if you feel like he's an anti-Pope, come see me after Mass and I will dispel your doubts". Huang did not offer a session of catholicotherapy, he declared a sentence. 2.5) I had never seen such a thing. I'm 55 years old. I was baptized 8 days after my birth. I try to go to Mass every day. I've heard many sermons! But I've never heard a priest say something during Mass like: "If you have this or that theological opinion, go away, and don't come back here!" 3.1) The Catholic Faith. My Profession of Faith in Jesus Christ and His One and Only, Holy, Catholic and Apostolic Church is easy to find on the Internet. 3.2) Respect for the Holy See and the Magisterium. Here again, if there is anyone in Quebec who defends the Magisterium tooth and nail, it is me! 3.3) The holy contempt we must have for false prophets and pseudo-mysticism. I have a track record of years of fighting against false prophets like Marie-Paule Giguère (founder of a religious cult here in the Quebec City region). In addition, many can attest to my impatience when someone begins to rant about "revelations" and "prophecies" (concerning Jorge Mario Bergoglio or any other subject). I believe Revelation ended a long time ago [CCC, #65-67]. 4) Is my position obviously wacky? If someone tells you that the Moon is made of cheese, or that your car will continue to work very well if you fill up your gas tank with water, you don't need to scrutinize these claims. They're wacky. 4.2) There have already been anti-Popes in the history of the Church. There has never been a unicorn or chimera, but there have already been anti-Popes. 4.4) A Pope who resigns is extremely rare. To my knowledge, of the approximately two thousand years of Church history, there have been two Popes who have offered their resignations, the most recent of which is Pope Benedict XVI on 2013-February-28. So the current situation is unusual. Note the hyperlink for the expression my opinion, which leads to the description of what an opinion is, strictly speaking. By definition, when one has an opinion strictly speaking, one is not married to one's position. We are open to the idea that we can be wrong. We are still afraid of being wrong. It's the opposite of obstinacy. Not only is my opinion not stubborn, but I am actively searching for light. If my opinion on Bergoglio is false, I want to know! I ask nothing better than to be enlightened by someone more virtuous and more competent than me. In fact, one of my dreams is to participate in a debate against Cardinal Gérald-Cyprien Lacroix (the only person in this diocese who is officially mandated to perform excommunications). 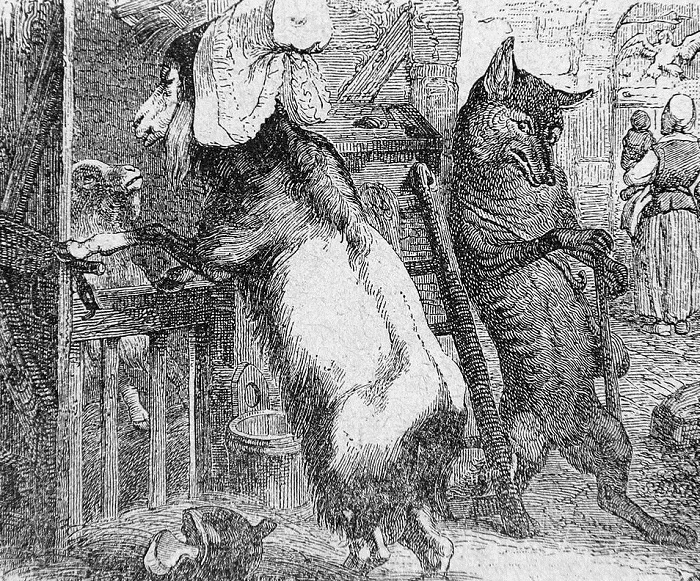 In these trying times where there are wolves in the sheepfold, we should all re-read the fable of Jean de La Fontaine called "The Wolf, the Mother Goat and the Baby Goat". In a nutshell, the Mother Goat sternly warns her Baby goat before leaving, forbidding it to unlock the door to strangers. She gives the Baby goat a password, but of course, the wolf happens to be around and hears it! So as soon as the Mother leaves, the wolf tries to pretend to be her, by giving the password. The Baby goat, wisely, asks for a second verification (the famous French expression: "Showing the White Foot"). Since the wolf cannot put his paw under the door to show it's not a wolf's paw, he leaves without harming the baby. Problem solved! "Showing the White Foot" is important for baby goats, but even more important for organizations. The science of Sociology tells us that the most intelligent and most efficient way to destroy any organization is to insert an attacker inside that organization, preferably at the highest levels of the hierarchy. Remember also that the Catholic Church teaches that Satan is the most intelligent creature in the Universe, and that the Devil is actively trying to destroy the Church. So guess what might be Satan's Ultimate Attack Plan? 7) Is Bergoglio really an anti-Pope? I like science. I like scientific experiments. Is Bergoglio really an anti-Pope? I invite Father Garrick Huang (and all other Catholic priests) to do the following experiment. You'll need a sheet of paper, a pen, and a good industrial stapler with at least four staples. 1) It is asked whether, following the affirmations of Amoris Laetitia (#300-305), it has now become possible to grant absolution in the Sacrament of Penance and thus to admit to Holy Communion a person who, while bound by a valid marital bond, lives together with a different person more uxorio without fulfilling the conditions provided for by Familiaris Consortio, #84, and subsequently reaffirmed by Reconciliatio et Paenitentia, #34, and Sacramentum Caritatis, #29. Can the expression «in certain cases» found in Note 351 (#305) of the exhortation Amoris Laetitia be applied to divorced persons who are in a new union and who continue to live more uxorio? 2) After the publication of the post-synodal exhortation Amoris Laetitia (#304), does one still need to regard as valid the teaching of St. John Paul II's encyclical Veritatis Splendor, #79, based on sacred Scripture and on the Tradition of the Church, on the existence of absolute moral norms that prohibit intrinsically evil acts and that are binding without exceptions? 3) After Amoris Laetitia (#301) is it still possible to affirm that a person who habitually lives in contradiction to a commandment of God's law, as for instance the one that prohibits adultery (Matthew 19:3-9), finds him or herself in an objective situation of grave habitual sin (Pontifical Council for Legislative Texts, «Declaration,» June 24, 2000)? 4) After the affirmations of Amoris Laetitia (#302) on "circumstances which mitigate moral responsibility", does one still need to regard as valid the teaching of St. John Paul II's encyclical Veritatis Splendor, #81, based on sacred Scripture and on the Tradition of the Church, according to which "circumstances or intentions can never transform an act intrinsically evil by virtue of its object into an act «subjectively» good or defensible as a choice"? 5) After Amoris Laetitia (#303) does one still need to regard as valid the teaching of St. John Paul II's encyclical Veritatis Splendor, #56, based on sacred Scripture and on the Tradition of the Church, that excludes a creative interpretation of the role of conscience and that emphasizes that conscience can never be authorized to legitimate exceptions to absolute moral norms that prohibit intrinsically evil acts by virtue of their object? Then you answer the questions on that sheet of paper. (If you want to cheat by copying off another student, my answers are: No, Yes, Yes, Yes, Yes.) Sign, date, and go and staple this sheet on your church's door. Take a selfie of yourself and your statement, and put it on the Internet. Send an email to your bishop to tell him the news. Talk about it in your parish newsletter. Make sure everyone in the diocese knows. Then wait for your bishop's reaction. What? You do not have the courage to try this scientific experiment, despite the fact that you are a Catholic priest? In that case, perhaps you should have a little more respect for your parishioners who have the courage to remain loyal to the Holy See, despite the bullying and slanders of the satanic wolves who are inside the sheepfold. 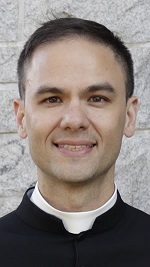 Don't misinterpret me: I haven't stopped going to Mass at the FSSP, and I'm very grateful to have good priests like Fr. Demets and Fr. Huang. I would be pretty desperate if they were not here in Quebec City. About a week after these events, I learnt that Father Huang's sermon was actually targeting somebody else. Father Huang also left me a voicemail to explain I was not excommunicated and still had access to all the Sacraments. I decided to leave this article up, as is, because I still think its main point remains valid: pastors who scrupulously avoid any kind of public criticism against the errors disseminated by Jorge Mario Bergoglio, AND who simultaneously ask the faithful to call him "Pope" and to submit to his leadership, are endangering the flock.